Almost two years after the events of September 11 devastated the Lower Manhattan area, large crowds and bustling outdoor restaurants again congest the sidewalks on West Broadway and Duane Street. The physical repair of major buildings in this area has erased many outward signs that a great tragedy occurred here. However, many private businesses in Lower Manhattan are still on shaky ground, and a lack of aid combined with the limitations of their local customer base have caused them to flounder. The brave ones left are holding in. 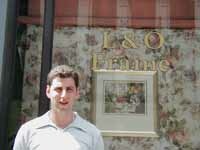 Lawrence Levinson, proprietor of L & O Frame, stands before the front window of his Downtown store. Photo by Kevin Wong. L & O Frame is one of many private niche businesses that, once greatly successful, is a case in point. Founded 17 years ago by Lawrence Levinson, who opened it under his own name with $1500 in his pocket, L & O Frame is a family business that consists of Mr. Levinson, his wife and his brother, Bruce. L & O Frame is located between Gallery Tribeca Antiques and Second Hand Rose at 140 Duane Street, and it has been operating out of this area since its inception. With corporate work having virtually vanished since the September 11 attacks, L & O is getting by, just barely, with a steadily diminishing stream of business from artists and private individuals. In doing so, it is cementing its place in the community while waiting for the economy to turn. L & O frames, as Mr. Levinson puts it, "just about everything," including newspaper articles, photos, artwork and financial ads. For this reason, the people who commission Mr. Levinson's framing work are equally diverse, and they include individual artists, private galleries and big corporations. Boasting lower prices than the surrounding competition and "really good work," Mr. Levinson's business has developed an impressive clientele, including Merrill Lynch, Smith Barney, Barclays Capital, Mackenzie and The Wall Street Journal. The financial, or "tombstone," ads for major corporations such as these would come 20 or 30 at a time, and Mr. Levinson was no stranger to working 19 hours a day to satisfy all of his customers. "Before September 11, this phone would be ringing off the hook," Mr. Levinson states proudly while pointing to the telephone on his desk. "I wouldn't even have time to talk to you! After September 11, private [marketing] got really quiet. Corporate marketing is completely dead. I haven't seen Merrill Lynch in around five months." On the morning of September 11, Mr. Levinson was headed towards the World Financial Center. Fortunately for him, the bus driver was 10 minutes late, and instead of being on the flame engulfed bridge to the World Financial Center, he watched from a short distance as the first airliner crashed into the World Trade Center. Mr. Levinson went back to his store, took in an Italian family that sought refuge and pulled down the metal security gate to weather the disaster. Fortunately, the metal flap protected the store from the flying debris. However, other hindrances prevented L & O Frame from immediately opening for business again. For the first two weeks after September 11, L & O Frame did not run any machines in the store, since that would draw electricity away from city workers, who needed it for repair efforts. For two months, suppliers stopped deliveries to L & O Frame. Most drastically, the store did not have working telephones for six months, causing many of Mr. Levinson's clients to think that he had closed. "People are surprised that I'm still here," says Mr. Levinson with a sad smile on his face. For the first three months since September 11, Mr. Levinson estimates that he lost $75,000 in business (not to mention half of his outside investments). Over the course of the first year since September 11, Mr. Levinson estimates that L & O Frame lost 75% of its clientele, and if he had employed any staff, he would have had to close the store. However, he persevered, and in the second year since the tragedy, he has gained back 65% of his business from individual customers, although his corporate business has stayed consistently low. Although his situation is better now than it was before, he still struggles, because his rent has not decreased since before the tragedy. L & O Frame's recovery is in no part helped by the increased security in corporate buildings since September 11. Before the attacks, Mr. Levinson used to walk into Downtown office buildings to solicit business from different companies. Now, because of increased security, he needs an appointment and a specific person to see in order to get into major buildings. This prevents him from acquiring new clients easily, and it hinders him from easily getting the old ones back. Since his customers are largely financial firms, Mr. Levinson's business rises and falls with the stock market. Referring to his contacts at these corporations, he muses, "They say they don't know if they still have jobs." City, state and national relief efforts proved fruitless for this small business. Being self-employed, Mr. Levinson was not eligible for disaster unemployment. It was hard to get informationon on assistance opportunities: meetings that the Downtown Alliance held did not, as Mr. Levinson put it, "tell us anything we didn't already know." To make matters worse, most meetings on emergency aid were held during business hours, when he would have to close the shop to attend. He was reluctant to take out loans, and grants were not forthcoming. Mr. Levinson recalls that after his wife waited for 4 1/2 hours at the Red Cross to get financial aid, she was turned away after being told that the Red Cross had "changed policy" towards businesses in the private sector. Mr. Levinson is skeptical towards how all organizations awarded emergency aid. He is angered that a nearby restaurant that had closed to give the city firemen free food received 5.8 million dollars in aid, and he wonders where hundreds of millions of dollars from the Liberty Fund went. Mr. Levinson has also observed the economic effect that September 11 has had on the community immediately surrounding him. He takes the view that many prosperous newcomers, with "million dollar lofts" in the Downtown area, are there only to be close to Wall Street. They are uninvolved in the community, he says, and they even shop uptown. He also asserts that many developers are participating in a land grab and are forcing rents up. This forces many artists, who cannot afford the additional living expense, out onto the streets. Celebrity clients interested in antique furniture once frequented Gallery Tribeca Arts next door, but the storefront space is currently up for sale/lease. In Mr. Levinson's neighborhood, 33 restaurants have gone out of business, and many artists have moved upstate and stopped doing business in the city. Among the artists who remain in the Lower Manhattan area, many cannot afford to have their artwork framed. Mr. Levinson is proud to have matted many needy artists' works and to have donated mats free of charge. He framed all of the 9/11 memorials at the Duane Street Fire Department, and he has donated mat boards to the Buckle My Shoe School, a preschool in the area that has suffered low attendance rates since September 11. His secret to survival in the midst of tragedy and economic decay is to "be flexible." He has a "forward thinking approach" to his business, and although the profit margins he wants may not exist now, he hopes that his clients will remember his good will in the future. If you asked me a year ago, I would have said 'no [I won't succeed].' Now, I have a chance."